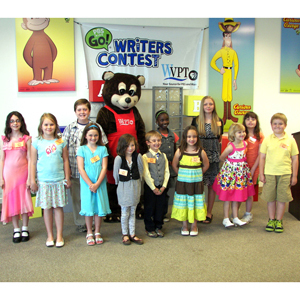 On Thursday, May 24th, WVPT held a reception to honor the winners of the PBS Kids Kids Go! Writers Contest. All first-place winners from Western Virginia will be entered into the national PBS Kids G0! Writers Contest, where they will compete against area winners from across the county. The contest, presented locally by WVPT with national funding support from Studentpublishing.com, encourages children in grades K-5 to celebrate the power of language and creativity by creating and submitting original stories and illustrations. WVPT was one of 63 public television stations across the country that participated in this year’s contest. The PBS KIDS GO! Writers Contest is produced annually by PBS KIDS and managed and created by WNED-TV Buffalo/Toronto, and is a part of PBS KIDS Raising Readers, a national initiative that uses the power of public media to build the reading skills of children ages two to eight. More information on PBS KIDS Raising Readers and the PBS KIDS GO! Writers Contest can be found at pbskids.org/read. The winning stories can be viewed online at http://www.wvpt4learning.org/winners2012.html.